I know a lot of people are new to the blog, so welcome! Come and get away for a while. For the last 6 months I have been posting guest posts on Saturday, in a series called "Introvert Saturday." Unfortunately, I have run out of guest posts. So, consider this an invitation to write about your experiences as an introvert. 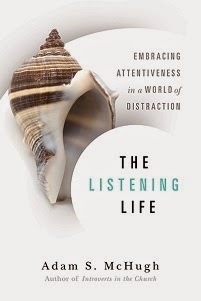 I would be especially interested to hear about how introversion interacts with world cultures. It seems like for a while I was getting a lot of emails from Canada, then from the UK, and now from Australia. I would love to read posts about introverts in Africa, in Hispanic countries, and in Asia, and from pretty much anywhere else. I'd also be curious to hear about the experience of introverts in black, Hispanic, and Asian churches. Please write me a post! 500-600 words emailed to adamsmchugh at gmail dot com. For now, for those of you who are new, I want to post a few of my favorite reviews of my book, Introverts in the Church. What's great about them is that they are not just book reviews, but they also include stories about the experiences of introverts in our culture. Popular blogger Rachel Held Evans asks if you are Extrovert or Introvert? A review of Introverts in the Church. 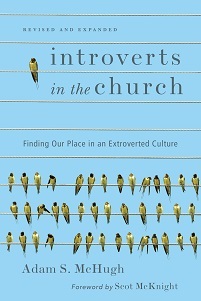 Mark D. Roberts posts a 4 part series: Introverts in the Church: An Interview and Review. From a Reformed perspective, check out Steve McCoy at Reformissionary (still my all-time favorite review) and Trevin Wax at The Gospel Coalition. And last, check out Internet Monk on Introverts in the Church.